I love to read, write, and have a laugh! But mostly, I love PURPLE!! Hi!!!! I LOVE UNICORNS, CUPCAKES AND GIRLY COLORS!!! XD I love to live, I live to laugh and so onnnnn.... As you see, I live in cupcake world, and to be precise, in Marshmallow street, and in my country anything is edible! Like the streets are made of caramel biscuits and the houses are made of chocolate!!!! That's soooo true!! Umm, what else?? Oh, ok.. I have light brown eyes, but when the sun comes in my eyes, they are either, hazel or golden brown, don't ask, I dunno why.... .-. I have reddish brown hair, they are wavy + curly, I am in total love with my BlackBerry *-* Well, that's it!! BYE!!! I 'm homeschooled and absolutely love to draw, animate, sing,...etc. Yeah I'm a dork but that's why one of my favorite websites is Dork Diaries. P.S. I'm pretty much a 24 hr babysitter when it comes to my bothers and sisters! Well... I don't really like talking about me but.... Right now I am wearing a super cute outfit but I am not like ALL CCP but I can look neat can I. I love me!!!! I am totaly cute and purfct at splling!!! Bye Guys!!!! 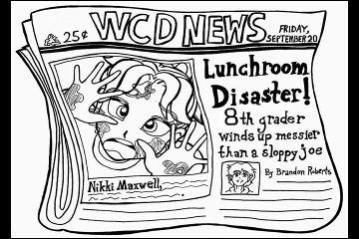 I am a big fan of Dork Diaries - I am actually jealous of Nikki. I too, am a huge dork and I am excited a fan has put together a newspaper for this amazing book now! I love cupcakes, dogs, purple, blue, green, white, friendship bracelets, laughing, happiness, some novels, movies (usually cartoon ones), and I could act sweet and innocent and have a small, cute, and childish-like voice if I could! :DAnd I love saying LOL and I LOVE 1D!! :DOh, and my real username (my original name) is Sweet Cupcake! ~Cupcake Cutie! <- I LOVE this smiley face! Well, my FAV authors are Rachel Renee Russell (Dork Diaries), Veronica Roth (Divergent), and Suzanne Collins (The Hunger Games). My favourite movie is Taking 5 (2007). My favourite TV show would be Victorious or iCarly. My favourite color is magenta/purple. I usually go on DorkDiaries.com, and I loves it there. My favourite singers are Demi Lovato, Adele, Victoria Justice, Ariana Grande, Liz Gillies, Taylor Swift, Katy Perry, and...No one else o-o. My FAVOURITE BAND IS ONE DIRECTION. I just love them! My dream about a celebrity is that I go to LA, and sing a song in the middle of the street O-O. Everyone ABSOLUTELY loved me! Then, Taylor Swift comes up to me and says "OHHH, YOUR WAY BETTER THEN MEH!" And leaves to make a song o-o. Then, Dan Scheider (the maker of iCarly and Victorious) offers me a TV show, and I take it. Then I become as famous as Katy Perry!!!! O-O So, yeah that's me. I LOVE LOVE LOVE Edward Elric from Fullmetal Alchemist! But I like manga and stuff like that. And you can't forget dork diaries! Hi! I'm Harmony! Um, the dog in the picture is mine :3 she's so CUTE! I love to dance, sing, hanging out with my friends and i came here to make friends and HAVE FUN!!!!!!!!! !